Last semester, my freshmen spent a couple of weeks writing essays. It was their first major writing assignment for me, and I wasn’t sure precisely what to expect. When I collected the finals, though, I knew that I could — and should — expect better. The vast majority of the students simply hadn’t tried to do well. My kiddos and I had a little heart-to-heart. I told them that their papers were sub-par. I also told them that I knew they could do better. And I told them that I had one piece of advice for them that would help more than anything else as they revised these essays. Settling for “good enough,” I explained, was not, in fact, good enough. I reminded them that sometimes we all fall short of the mark we’re trying to reach, and if that mark is just “good enough,” then we don’t have much room to fall, do we? Chastened, my students went to work on revising their essays. (FYI: The “chastened freshman effect” lasts, at most, one class period.) As they worked, I started thinking about the lecture I’d just given…and my own need to take that advice. Because I, too, settle for mediocrity. Just like I told my students, none of those things are “good enough.” Those instances of settling make me a worse teacher, friend, runner, and wife. And I don’t want to be mediocre at any of those. So I’m challenging myself (and you!) 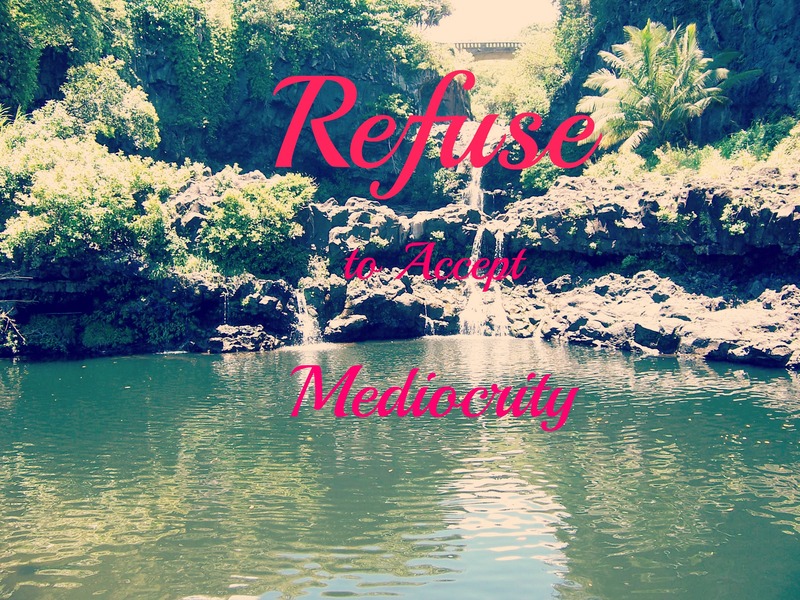 not to settle for mediocrity. To push for excellence and strive for our best in every important aspect of our lives. To rise to the challenge, even when rising is more difficult than we anticipate. Even if we fall short of excellence, we’ll still be far beyond mediocre. No questions today, but share your thoughts! It’s so easy to settle. My students (and I) have the same issues. This is beautiful. I was just thinking last night how I settle for mediocrity every single day. I’m not exactly living at the moment. I’m simply just existing. I need to stop settling and start going above and beyond. I think it gets worse as we get busier, too…it’s hard to be awesome across the board. “I like my comfortable little space”… perfect way of putting it! Bam! Needed this today! I slept in through my normal morning run and I was just going to do an easy run home after work, but instead I stuck to my plan and knocked out some killer hill repeats. TOTALLY WORTH IT! Thanks for the inspiration =). This is hard because for so long I pushed myself so hard on certain things. So on other things, I only could be mediocre. I like to balance myself and know what I can and cannot handle. Of course, I want and need to push myself on so much stuff, but I have also spent a lot of time trying to be OK with doing some things just OK and not losing sleep over them. But a very inspiring post and I will remember it next time I turn a tempo run into an easy one (ugh-story of my life!). Yeah, it’s definitely about balance…you have to choose the areas in which to shoot for excellence and where it’s okay to just be good enough. Otherwise we’d be constantly burnt out. Loved it. I need to get my act together. Thanks for the reminder. This is awesome and inspiring! Thanks for sharing!!! I totally get where you are coming from. It is hard to watch others settle for less than what they are capable of. I tried my hand at teaching for a few years and this made me the “strict” teacher.. but I hope the students came away with something they could be proud of.